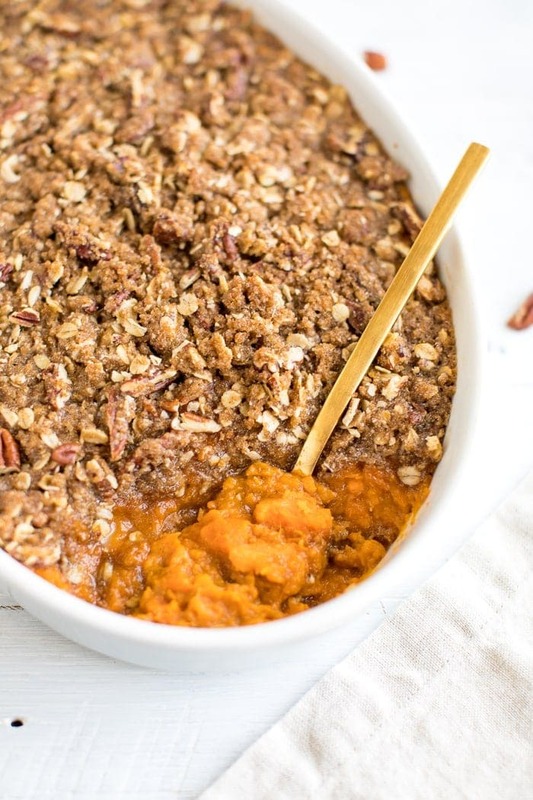 Everyone loves this healthy sweet potato casserole with a crunchy pecan topping. It’s lighter in sugar, absolutely delicious, vegan and gluten-free! Sweet potato casserole has always been my FAVORITE holiday dish. Growing up my mom made it three times a year — Thanksgiving, Christmas and Easter — and I was always so pumped to have it. Creamy sweet potatoes topped with a crunchy brown sugar topping = the best! Nowadays we typically spend Thanksgiving with Isaac’s family and they do the sweet potatoes with marshmallows on top. I like them okay, but I miss the crunchy, oatmeal pecan topping. This shouldn’t be too surprising given my obsession with all things crunchy. Btw, if you’re looking for a healthy sweet potato casserole with marshmallows on top, this looks like a good one to try. Anyhow, I finally decided to use my mom’s classic recipe as a guide to make a healthy sweet potato casserole that’s made with better for you ingredients but not so “healthy” you don’t feel comfortable sharing it with family for a holiday meal. You know what I mean here, right? There are certain healthy recipes that I make for myself and Isaac and I LOVE them but I wouldn’t bring them to a party or a holiday dinner. This sweet potato casserole isn’t one of those recipes. It’s meant to be shared. My mom’s recipe uses canned yams, white sugar, white flour, eggs and butter. With a few small tweaks I was able to make a healthier version that’s also vegan and gluten-free! 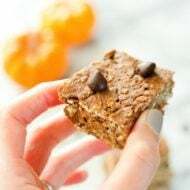 I used fresh sweet potatoes, oat (or almond) flour and oatmeal for the topping, coconut oil and flaxseed to replace the butter and eggs, and maple syrup instead of white sugar to sweeten the filling. The one thing I didn’t change was the brown sugar for the topping. I wanted to make sure it still came out crunchy like the original version so I stuck with organic brown sugar. Coconut sugar might works well too if you happen to have that on hand. We LOVE this healthy version of sweet potato casserole so much… maybe even a tiny bit more than mom’s, but we’ll keep that a secret. 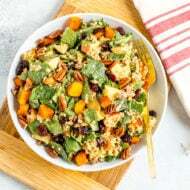 If you make this healthy sweet potato casserole be sure to leave a comment and star rating below letting us know how it turned out. Your feedback is so helpful for the EBF team and our readers! 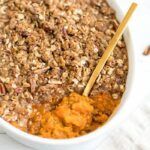 You (and your family) will love this healthy sweet potato casserole with a crunchy pecan topping. It’s lighter in sugar, absolutely delicious, vegan and gluten-free! Meanwhile, preheat your oven to 350°F and spray a little cooking spray on a 9×13 or 9×9 inch casserole dish. Place sweet potatoes into a large bowl and mash them with fork before adding coconut milk, maple syrup, oil, flaxseed, vanilla, cinnamon, nutmeg, and salt to the bowl. Mix until everything is combined. Spoon the sweet potato mixture into the prepared dish and sprinkle on the brown sugar and pecan mixture. Bake uncovered for 40-45 minutes, until the top is golden brown and the sweet potatoes are bubbling. Looks yummy! Love the dish you made it in too, very pretty! Looks so good! We got our Christmas tree this weekend too. It was great to put up the lights and decorate. Yummy! This is right up my alley and I may need to put it on my “request list” for when I visit my parents over Christmas. Mondays are not fun, and this one is extra hard. But at least it’s good to get back to healthy eating for the week! I eat sweet potatoes all year round so I’m glad you didn’t wait to share this one! 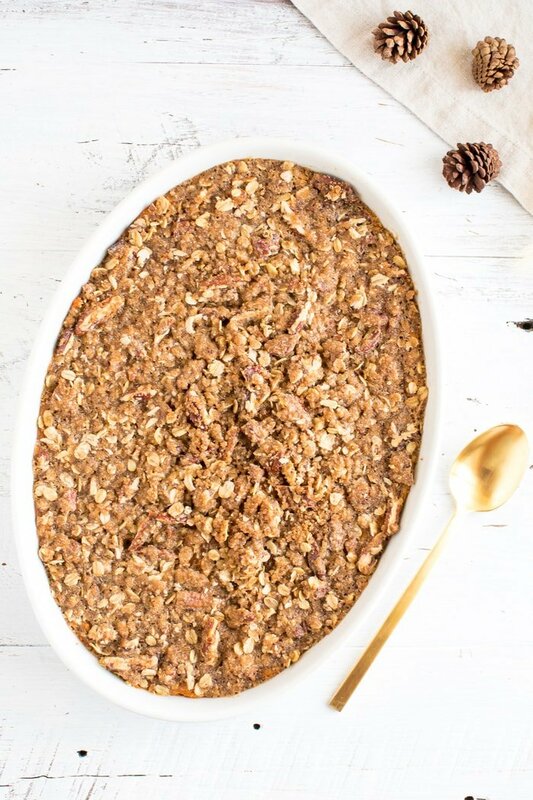 Love the idea of crunchy pecans on top- my favorite topping for sweet potato casserole! I’m glad you didn’t wait til next year – I’m making this like, NOW. I don’t see how much vanilla or cinnamon to add? Hi. Does this freeze well? I’m desperate for as many “make-ahead” recipes to get a jump on Thanksgiving and not be worn out by party time. Thank you! Sounds good! Can you prepare it the day before and bake the next day? I’m hoping to use this on Thanksgiving! Yup! I actually made it last weekend and prepped it in advance. Worked out great! Do you think you could substitute Stevia for Maple Syrup? Do you add the ground flax seed to warm water as an egg substitute? the recipe didn’t really mention when or how to add the flax seed? Thank you!! Hi Cheryl. You just add the ground flaxseed to the sweet potato mixture. Sorry that wasn’t clear. Just updated the recipe. If the flaxseed were left out, would it change the consistency of the casserole at all? I’m wondering if it’s just for health benefits. It’s more for the health benefits. It will be fine without it if you don’t have any on hand! Hey there Brit. If we wanted to use eggs instead of flax seed, how many eggs would you recommend? Would you then keep the coconut oil measurement the same? The vegan version I made this year was almost the same. Except I add coconut to my sweet potatoes, some unsweetened Cashew milk and use Agave for sweetener. (In the past I used Eagle Brand milk so I was looking for a healthier substitute. I did not tell family members that I had changed my recipe. Several commented that it was even better than last year. My picky Dad even went back for seconds. This looks amazing! Can you confirm if you’re using regular coconut milk (like drinking milk) or the coconut milk that comes in a can and is thicker? Also by chance do you have the recipe for the mini version? I’d love to make a small portion just for me on any given day ???? Hi. I can’t have maple. Do you think honey would work instead? Would I need to change the measurement? Love this recipe remake! Looks so delicious! I t looks amazing. My grandson allergic to nuts, what can I substitute ? Do you think you could substitute almond milk rather than coconut milk? My daughter doesn’t like coconut. Yes! I think almond milk would work fine! This recipe is awesome! My kids love it! I do put a lil butter in mine and a beaten egg. I love this website! What else would work instead of almond flour? It comes in large quantities and afraid it will go to waste. Want to make this for Thanksgiving for a brother-in-law who is gluten free. Oat flour or gluten-free all-purpose flour will work too! This looks reeaaally good, especially that crumbly topping! The topping is the best part, for sure!! This looks so good, I might have to make this to have as part of breakfast next week! Do it!! It would be delicious for breakfast. Do you mix in the liquid portion of the canned coconut milk or just measure 1 cup of the solid cream part? This looks perfect for this year’s feast, thank you for republishing the recipe!! Good question. I shake the can before opening so that the liquid portion is mixed with the cream on the top and then use it. Hope this helps! I have made this twice now! So delicious. I even had some people who don’t eat sweet potatoes eating them! Thank you for this great recipe! 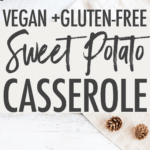 This was my favourite recipe for Sweet Potato Casserole, I last made it at Christmas, but now you can’t see the recipe on your website! It just shows all the pics but not the list of ingredients or instructions. Please help!! Can you repost this recipe? I’m so sorry for the inconvenience. I’ve been making some changes to the back-end of my site to help speed things up and this recipe was deleted in the process. I went in and updated it so it should be good to go. Enjoy! Please help!!! 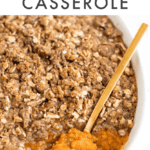 This is my favorite sweet potato casserole recipe and I just went to look at it again because I plan on making it for Easter and the recipe isn’t coming up. I used my phone and the computer so I’m thinking it’s not just me. Can you please send me the recipe or try to get it loaded back onto this page? It will be greatly appreciated 🙂 Thanks! Hi Becky! Thanks so much for letting me know about the recipe issue. I’m so sorry for the inconvenience, but the recipe is updated now! I hope you enjoy the casserole this weekend. Happy Easter. We tried this new recipe for our family Thanksgiving. Now that we have a dairy-free nephew, we have to give up our old (butter-filled) recipes and search out new ones. THIS ONE IS AWESOME!!! Give it a try with your families this year! You won’t be disappointed. Excited to try this for Thanksgiving! Just put this in the oven for the second year because it was such a big hit last year. Doubled the recipe this year so we’d have plenty! Made your sweet potato casserole for Thanksgiving dinner. It camer out delicious! I made a couple of tweaks to the recipe. I roasted the sweet potatoes to add in the carmelized flavor. Worked great! I omitted the coconut oil and used almond butter for the topping. I omitted the coconut oil in the sweet potato mixture and replaced with a homemade walnut butter since it adds a buttery flavor. Worked great making it ahead then adding the prepared crumb topping just before putting in the oven. Initially, I planned to double the recipe, but due to sick guests cancelling after I baked the sweet potatoes, I’m going to make the second batch today and freeze it. I think I’ll freeze it in a zip lock bag molded to the size of the baking dish so it won’t have to be defrosted to fit the dish. Definitely a keeper recipe! Thank you for taking the time to create such a wonderful recipe. I made this recipe for Thanksgiving, and it was great! I loved the flavor of the sweet potatoes and the crunchy topping. Delicious, and healthier than so may other recipe. A keeper – I will definitely make it again. Hi, saw this on Instagram, great! One comment was for breakfast? Mairi-a: A sweet potato casserole is a traditional side dish for a main meal, especially a meal for the holidays or for a social event in the U.S. There are many traditional American recipes for sweet potato pie, which is a dessert and would contain very similar ingredients (brown sugar, maple syrup, vanilla extract, etc.). The chief difference is pastry dough for pie, and only a streusel topping for the casserole. 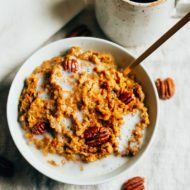 Breakfast casseroles are not as popular in the U.S. as sweetened cereal, but we typically make them egg-based, similar to quiche and are often light on vegetables and heavy on meat. 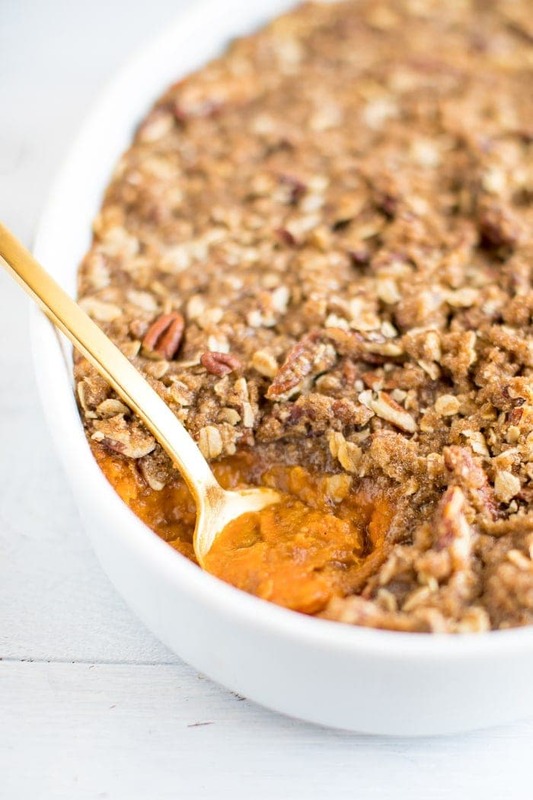 Having this sweet potato casserole for breakfast is not a traditional suggestion, but a very good way to increase the consumption of vegetables. Older, more traditional American recipes tend to emphasize sweet preparations with this particular root vegetable, but other cultures tend to prepare them with more savory ingredients. actually, the dish is not very eye-catching.But, okay, importantly it’s good for health. Can you tell me the taste of it ? Goood day!This is kid off off topic but I need some guidance from an established blog.